astromundane diary: The Lion's in the fire ! The Lion's in the fire ! The lion got free! US-Finance-Secretary Geithner, with such a sympathetic presence at first sight… in American politics * 18.8.19061, our affected top of the class, Tim … the assiduous. Stock-Exchange in rampage. Rally of 7%. Bank shares soaring through the ceiling. Dark musings, 2009-03-24 Steve Waldman. Today's must read. I must confess I missed this angle COMPLETELY, and it's bloody obvious. Consider a hypothetical asset manager, PIMROCK. PIMROCK reviews a pool of loans held by the bank J.P. Citi of America, and its analysts determine they are worth 30¢ of par value. The bank holds them at 80¢ on its book. PIMROCK agrees to put down $10B to purchase loans from the pool at 82¢ thrilling stock markets everywhere. It was all just a bad dream! 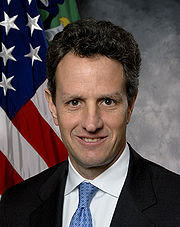 Under Geithner's plan, PIMROCK's $10B permits a $10B equity investment from the Treasury. Then the FDIC levers the whole thing up, providing $6 of debt for every one dollar of equity. So, $140B of bad loans are lifted from J.P. Citi of America, nearly $90B of which is sheer overpayment to the bank. Of course, as cash flows evolve, PIMROCK's $10B is wiped out entirely, as is the Treasury's investment. The FDIC gets repaid in a bunch of securities worth about $50B, taking a $70B loss. But, as Calculated Risk, likes to say "Hoocoodanode?" These were real market prices, Geithner or his successor will argue. Our private partners lost everything. There was no subsidy here. Meanwhile, taxpayers will be out around $80B. But haven‘t banks been Taurus? (Bulls)? Reliable, constantly incorporating? As long, as banks protected the deposits of their customers and loaned against collateral, sure. After Deregulation of the nineties mutated into aggressive hedge funds, this kind of Venus of the American East Coast unites now the herbivorous colossality of Taurus with the voracity of playfull predators for blood . Is she rogue, this Venus of the American East Coast and metastasizing and belongs she to be kept in a viral zoo? Her unification with Sun the gambler and Mercury the trader this week is going to reveal her virulence. And Mars, who is arranging the due Easter Schlachtfest in aries perhaps with hecatombs of taxpayers? Monday to Monday, 23. – 30.3. The deadline - alchemie of Goldman King Blankfein and his Geithner , revealing them preceding with unerring instinct grasping for the archetypical potentials, which the appalling, holy and powerfull FOURNESS = Fire – Earth – Air - Water has received, and is still emitting, in the scenarios of the four Kings Coniunctions. May their intention to be reaching for more than the profit of big money. Our Mars, the argentinian Saucepan , may hang near by us. Posted: 24.3. UTC: 17:18. Updated 28.3.2009, UTC 18:27.